Are you a bird lover who wants to create habitat to attract birds to your or your neighbors’ yards? Are you a native plant lover? Are you intrigued by observing wildlife in your own yard? 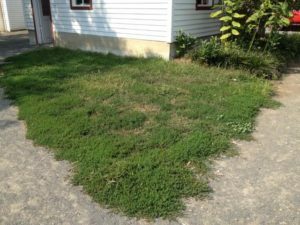 Do you lament the prevalence of English ivy, and sterile, conventional landscapes and lawns in Fairfax County suburbs? If so, this is the gig for you! Sign up to be trained as an Audubon at Home Ambassador and help transform the landscape of Northern Virginia, one yard at a time. A training/orientation session will be offered Saturday, April 1, at the National Fish and Wildlife Federation headquarters at 11100 Wildlife Center Drive, Reston, from 10 a.m. to 1. Bring a bag lunch. Please email Betsy Martin at audubonathome@folhc.org by Tuesday Feb. 26th if you’d like to sign up. Audubon at Home Ambassadors visit properties and provide advice to homeowners on what natives to plant, what invasives to remove, and how to improve wildlife habitat in peoples’ backyards. We certify properties as Wildlife Sanctuaries when homeowners adopt Best Habitat Practices, and when beneficial Sanctuary Species actually show up and use the yard. (Our motto is, “Let the animals decide.”) You can learn more about the Audubon at Home program at http://audubonva.org/audubon-at-home-1 . 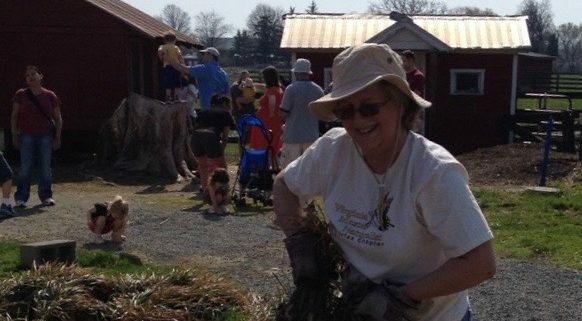 On April 1, Betsy Martin (Fairfax County Audubon at Home Coordinator) will give a presentation on the program and its philosophy, the role of Ambassador, and resources that will help you research and advise clients on native plants and habitat improvements. After lunch, Charles Smith of Fairfax County Stormwater Planning Division will lead a walk on the beautiful and natural NFWF grounds, showing trainees how to read a landscape, what to look for when assessing its habitat value, and how to think about creating wildlife habitat. Audubon at Home is an approved FMN service project. You will receive 3 hours of Continuing Education credit for attending this training session and service credit for each home visit. Are you thinking about supporting the City Nature Challenge? Here’s a super easy-to-follow-video to learn how. No need to say more–just watch. In 2011, Frying Pan Park did not have a pollinator garden. By October 2012, they did, and Fairfax Master Naturalist volunteers are the reason. Here’s the story. Frying Pan has a long history, and hosts thousands of visitors each year, many of whom are the future stewards of our environment: young children. My own children had participated for years in summer camps at Frying Pan, learning about farm life and farm animals, making butter, playing outdoors. In July of 2012, Ashley Stanton, then service project chair for FMN, put out a call for the development of a pollinator garden, as a “thank you” to Frying Pan for hosting our annual meeting. 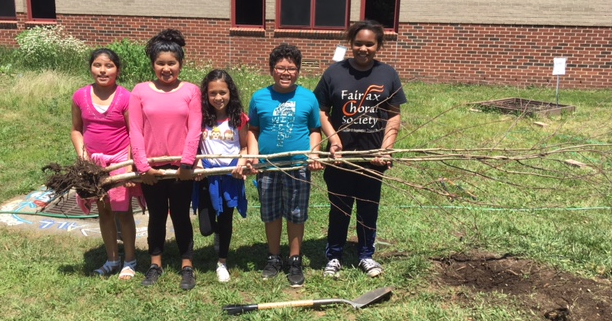 Sarah Mayhew, FMN Class of ‘07, pulled together a team of people from Frying Pan Park, the Fairfax chapter of the Virginia Master Naturalist program, and representatives of the Virginia Native Plant Society (Potowmack Chapter) and Earth Sangha. Without her strong leadership, this project could not have happened. Carmen Bishop, FMN ’07, served tirelessly as liaison to the park. A site was chosen near the historic farmhouse: the location wraps around the south and east sides of the park’s Dairy House, where a neglected garden, created by a Girl Scout troop about ten years back, was in need of a major retrofit. 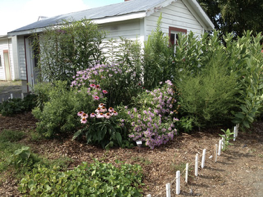 With lots of input from Carmen, Sarah, Cindy Morrow, Amol Kaikini, Terrence Liercke, Alan Ford, and Lisa Bright from Earth Sangha, I designed the pollinator garden in August 2012. By September, garden preparation was complete, and plants were donated by many FMN’ers, and by VNPS Potowmack and Earth Sangha. Why did VNPS and Earth Sangha choose to become involved? Expanding our understanding of the value of native plants, and putting those plants into the hands of Virginia homeowners, schools, and businesses, are key elements of the missions of these two organizations. 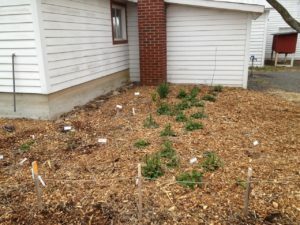 Personal connections matter, too: for example, then-VNPS Potowmack President Alan Ford is a Fairfax Master Naturalist, and these personal connections brought volunteers and donations of plants to the garden. Two planting days were all it took to get the garden established. The garden includes many plants important to bees, butterflies, and other pollinating insects, including goldenrods, bee balm, and milkweed. It’s one thing to get a garden started; the real challenge is keeping it going. Since 2012, I have donated over 275 hours of time caring for this garden, with help from the park (big thanks to Patrick McNamara and Marge Landis) and from FMN members. Cindy Morrow and Cynde Sears have been exceptionally helpful. The scope has expanded from the original Dairy House planting to maintenance and expansion of the herb garden around the Smoke House adjacent to the Dairy House. The herb garden was already a real magnet for pollinators of all sorts: bees, butterflies, flies, wasps, and more. It was already home to a substantial stand of our native mountain mint. Adding more native plants with culinary uses was an obvious addition to our mission at Frying Pan, and Girl Scout Rachel O, along with her sponsor Kay Fowler, added many of these plants in 2016. These photographs document the growth that made possible a dramatic increase in beneficial insects and their larvae in the garden: butterflies and moths (e.g., skippers, fritillaries, monarchs, cecropia moths) have been most prevalent. The garden has not only attracted more flying visitors—it has encouraged a considerable increase in two-legged traffic as well. 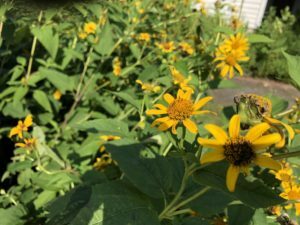 The pollinator garden has hosted Brownie and Scout troops, summer campers and school groups for presentations on the value of pollinators and the plants that host them, and a steady stream of park visitors now have an interesting destination right next to the historic farmhouse, and en route to the chickens. In addition, at the park’s major events, FMN has hosted information tables which reached dozens of park visitors. These tables were staffed by Marilyn Schroeder, Joe Gorney, Valerie Lamont, Barbara Whayne, and me. Join The Nature Conservancy and Fairfax County Park Authority to clean up your watershed! This spring cleaning will remove tires, plastic bottles, cans and other debris from local waterways, preventing trash from reaching the nation’s largest estuary, the Chesapeake Bay. 1,000 volunteers are needed to help cover 21 parks! This event is ideal for families, service groups, Scouts and individuals. Dates and locations are subject to change. Registration for the 4th annual cleanup event will open on March 1, 2019. Be prepared to help with this year’s City Nature Challenge by helping to identify last year’s iNaturalist observations! The group will meet in the cafeteria at National Geographic. Pizza provided! *Bring a laptop* and any field guides you want to reference. Have you been working on a service project that has a goal? Have you accomplished the goal or made progress toward achieving it? Have you been working in concert with others? Can you recount the accomplishments of your team? Nope, you don’t need to have solved world hunger or addressed climate change all by yourself. Some successes are simply incremental steps toward outcomes that benefit the environment in Fairfax County and northern Virginia. Every year, FMN reports stories of success to Virginia Master Naturalists. We’d like to share yours. How much help do you need from chapter members? Why is this activity worth the investment of time? How does it bring you pleasure? Would we have fun, too? Please send the story and 2-3 photos with captions to vmnfairfax@gmail.com. A member of the FMN Communications team will be in touch within a few days, and your story will be posted to this site. Yes, the time you spend on the story counts toward your service hours. 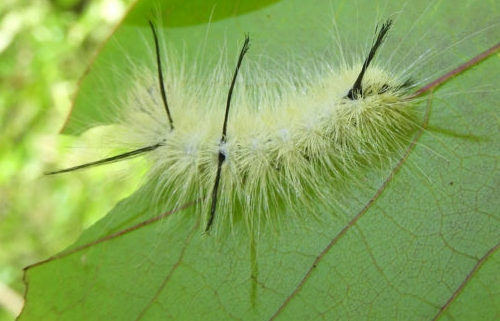 Learn about the Fairfax Master Naturalist citizen science project, CaterpillarsCount! (Service code C254 if you’re an FMNer), including the results from last year and plans to continue the project this year. FMN efforts are part of a larger study to determine whether seasonal activity of plants, insects, and birds are all responding synchronously to climate change. CaterpillarsCount! is part of a National Science Foundation-funded study with University of North Carolina, Georgetown University, and University of Connecticut as lead universities. Additional volunteers are needed to continue to collect data this year during spring and summer. Guest presenters: Elise Larsen, PhD, Georgetown University and Don Coram, PhD, Fairfax Master Naturalist. Location: Walker Nature Center, Reston, VA. Date and time: April 23, 7:00 – 8:00 pm. 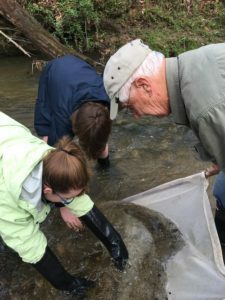 Join Loudoun Wildlife Conservancy for a stream-side demonstration and discussion examining how citizen science surveys can be used to assess local stream quality. You will see how biomonitoring surveys are conducted. You will have a chance to look at the data and at aquatic macro invertebrates. They will discuss how the data is analyzed and how it can be used to improve our streams. At the end, you will have the opportunity to sign up for a spring survey, led by one of Loudoun Wildlife’s citizen science stream monitoring teams. Registration is limited, RSVP to Loudoun Wildlife.